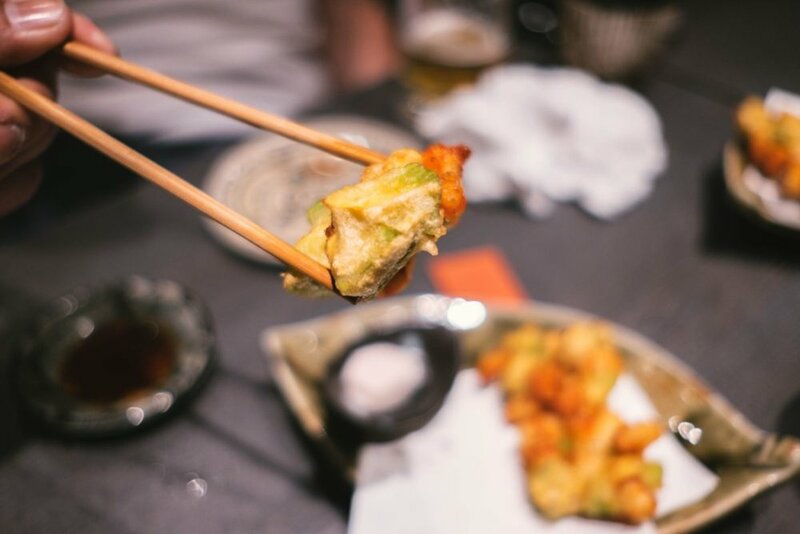 Meals are better when shared with others, and izakayas are the perfect place for that. In Tokyo, we got to experience what the majority of locals do after work, stay in the city and hang out with coworkers and friends. They usually view izakayas as extensions of one’s home, so they find their favorite spot and designate that as their meeting place. It’s a place to drink, eat, and just have a good time. With limited space in the cities, most of the bars and izakayas are tiny, which makes them more intimate and homey. 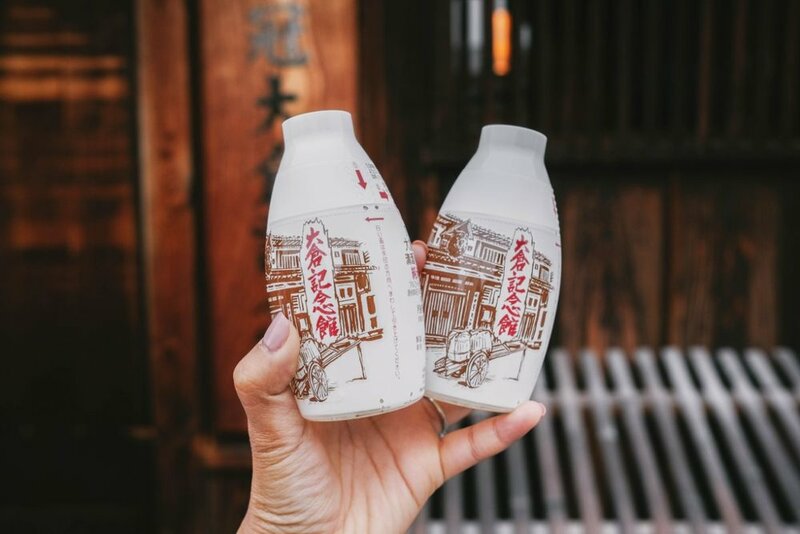 Instead of venturing on our own, we thought it would be best to join Ninja Food Tours’ Best of Izakaya. With the help from our tour guide Giulia, we were eating our way through Shinjuku with great company. The first part of our tour was walking to Golden Gai, a collection of bars and izakayas that seat only a handful of people at a time. Some bars had signs that said members only or foreign-friendly. We walked through during the day, but at night the place totally transforms. Now on with the tour. Right above our first stop was the famous Godzilla Head! Gindaco, a takoyaki chain, is known for their Tokyo-style octopus balls. Their takoyaki is a little crispier on the outside, super hot inside (let it cool), and just 100% delicious every single bite. 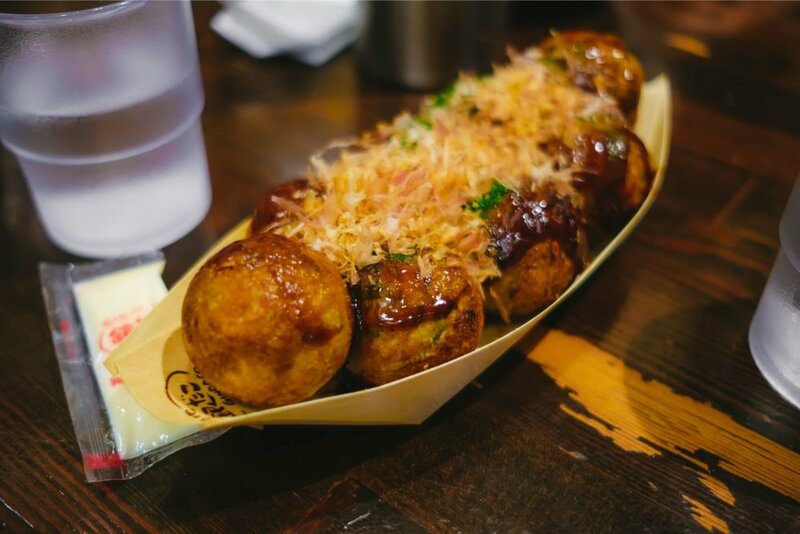 Takoyaki is a popular street food snack, batter balls cooked with bits of octopus topped with various toppings, like onion, mayo and bonito flakes! 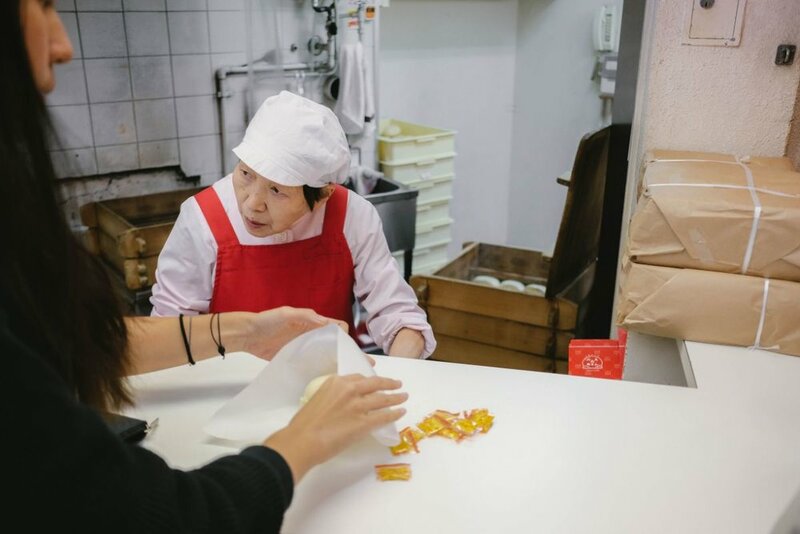 Our next stop has been serving up Shinjuku for over 50 years. We gathered outside to try their famous tonkatsu, which is deep fried pork that is also grilled in the oven for that perfect texture. We dipped our piece into the provided sauce (ketchup + soy based) and each bite was super crispy and delicious. We made it to our first izakaya, Buchiumaya, known for the tastiest okonomiyaki in the area. Our group took our places right in front of the grill where Mr. Takao, the owner and chef, greeted us with a welcoming smile. He started cooking while we ordered our first round of drinks. I decided to try a Hoppy, a non-alcoholic beer mixed with shochu. We started with grilled squid and rolled omelette, and then we tried two different styles of okonomiyaki, one with cheese and rice cake and the other topped with green onions. Okonomiyaki is a Japanese style pancake that’s grilled with many layers. It’s definitely big enough to share with another person! We walked into our next izakaya and to my surprise, they had an Avril Lavigne album playing (my jam). 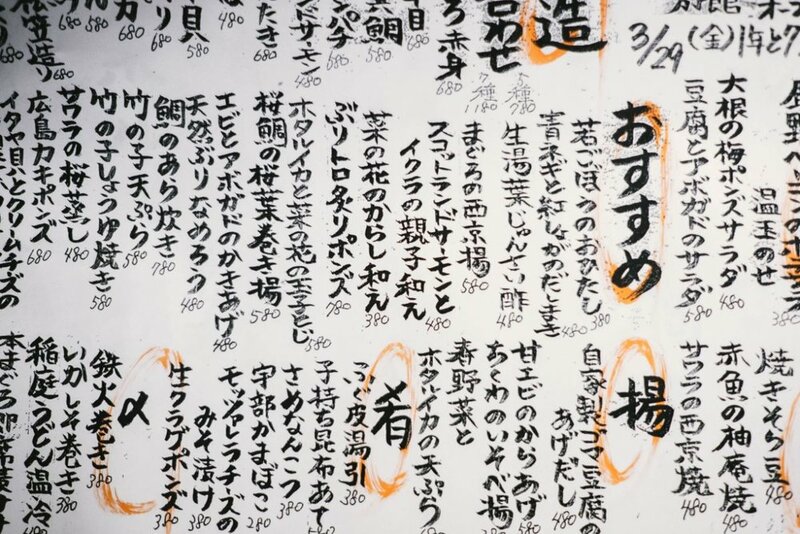 Takamaru is a seafood spot with menus that change every day. Our table ordered a round of highballs and had fresh sashimi to share. The tuna serving was generous, thick slices of fish! We also had crab croquettes and grilled fish head! Our last stop took us to Shinjuku station, which has over 200 exits! In Japan, people are always on the go and constantly commuting, so eateries and shops at the stations are high quality and shouldn’t be underestimated. We ended our tour with Chano Ikedaya, home to matcha ice cream made with real matcha powder. We got to choose if we wanted straight matcha or with a vanilla twist. Our night out in Shinjuku was complete and we got to experience the social culture that the city had to offer. Thanks for showing us the best of izakayas Ninja Food Tours! It’s basically foodie paradise, bright lights, street food everywhere, and giant versions of food decorating the front of many shops. 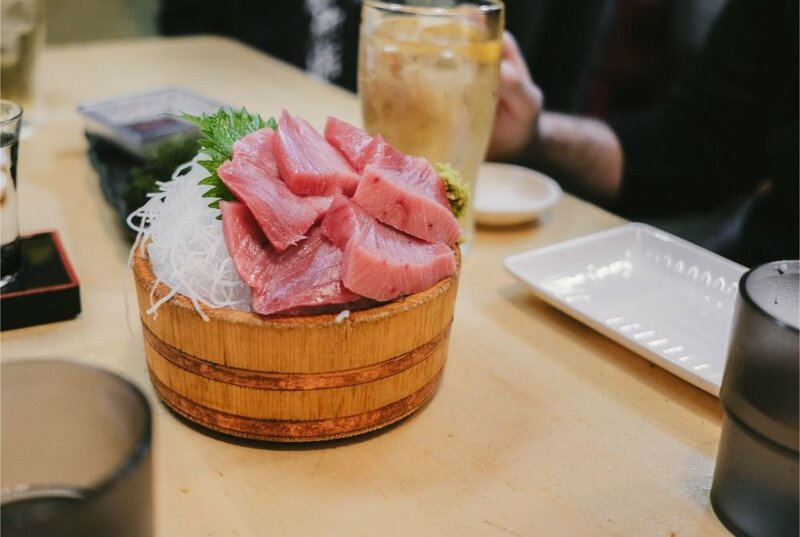 Osaka has an abundance of things to grub on, and that was one of the reasons why I decided to book a Namba Food Crawl with Ninja Food Tours. I didn’t know where to begin, and going on this food tour was a perfect start to our Osaka trip. We definitely came hungry and ready to eat, so come along on our tour and see what we got to taste! 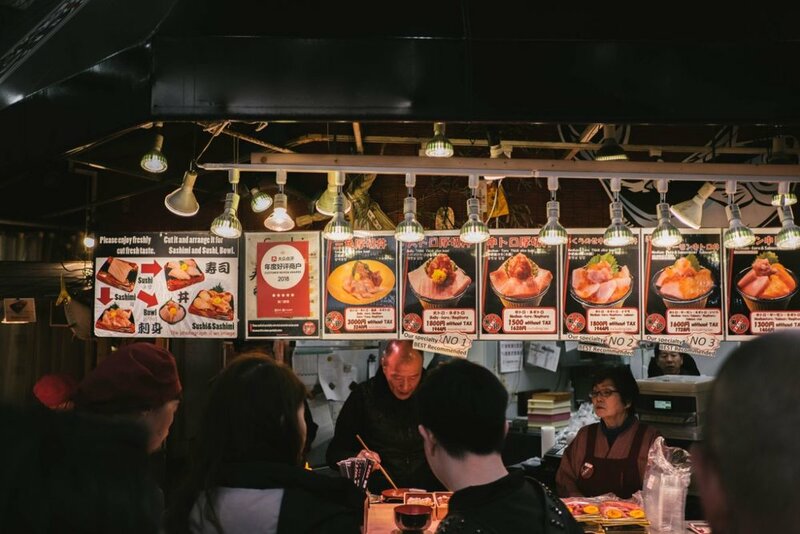 Our first stop was located in Kuromon Ichiba Market, where we tasted piping hot oden (fish cakes and tofu in a flavorful broth), got a glance at all the seafood stalls, and learned why strawberries were so expensive in Japan. We also stopped at Kurogin and tasted three different types of tuna sashimi. While waiting for our fish, our guide went into the Family Mart next door and bought our whole group a round of Japanese beer! So back to our tasting, we had a plate of three different types of tuna cuts: lean, medium, and fatty. Fatty tuna was by far my favorite, so fresh and it literally just melts in your mouth. We walked to our next location, which was hidden in a food hall style building. Our group sat around the stall Toronome Yokochu to try their kushikatsu. First, we ordered more drinks! I wasn’t even done with my first beer, but I ordered a highball (keep the drinks flowing). We also got to taste a popular cocktail made with ramune popsicle, soda water, and sochu. After this tour I was ordering this everywhere we ate! 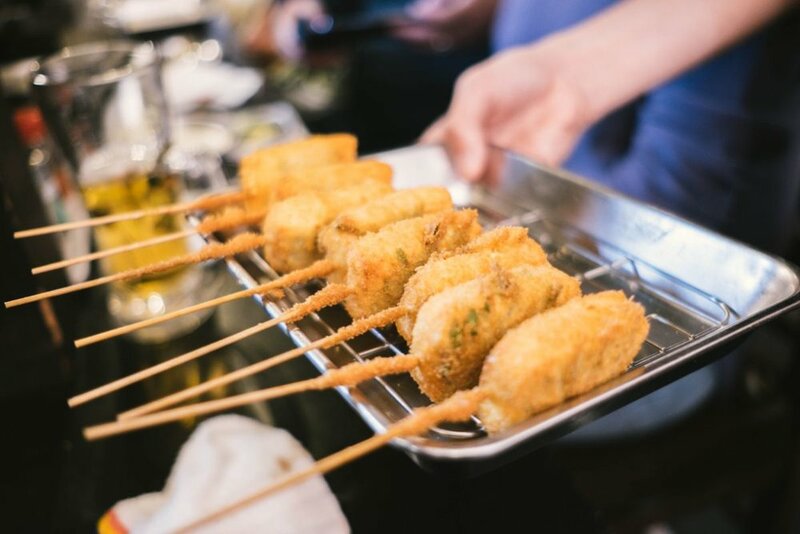 Our kushikatsu was now ready and we all got to taste a variety of deep-fried skewers. 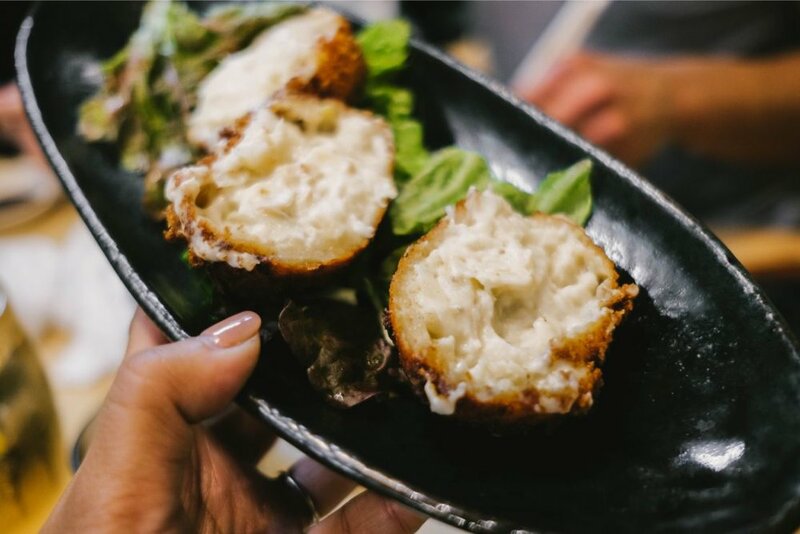 I took a bite into the cheese and ginkgo tree seed kushikatsu and immediately fell in love. Time to change up our palate, next stop was Hidezou, a restaurant known for their seafood. Before our meal, we had another round of drinks, this time we decided to order sake and cheers with everyone in our group. We had a few shareable plates like mackerel, octopus, shrimp + avocado tempura, roasted bamboo, and tamagoyaki (Japanese rolled omelette). Next, on the menu was pufferfish, considered a delicacy because of the care that must be taken while serving this dish. Pufferfish is poisonous but is edible as long as it’s prepared the correct way. So we risked our lives for food, but it was definitely worth trying! To keep the seafood train going, we walked over to Wanaka for takoyaki, one of Japan’s best-known street food. Takoyaki are batter balls cooked with a diced octopus with various toppings, like dried bonito, mayo, and green onion. We made sure to let the balls cool down, since they are fresh, the inside was still steaming hot. To wash it down we had cans of Kirin Lemon - not sure exactly what it was called, but it was alcoholic! On to the next stop, Futami no Nikuman, a shop that only sells steam buns. The lady working at the shop was super nice to our group and gave us full portions. The buns were absolutely delicious, each bite was soft and the bun complemented the flavorful pork. Most of us were full, so we saved the second half of our bun for later. (this is a good thing). We then walked through a small passageway lined with lanterns and then arrived at Dotonbori. This street was illuminated with lights and the crowd there was super energetic. During our tour, we stopped in front of the famous Glico Running Man sign! We ended our tour on a sweet note in Dotonburi at Lord Stow’s Bakery. Egg tarts are super popular in Asia and we came here to try the Japanese inspired flavors like green tea and sakura (cherry blossom). One bite into the tart and I was hooked, the crust was very savory and the filing was soft, creamy, flavorful and luscious. After our tour was complete, we were STUFFED. We had tried so many different types of food and definitely were pleasantly surprised by all the alcohol that was included. 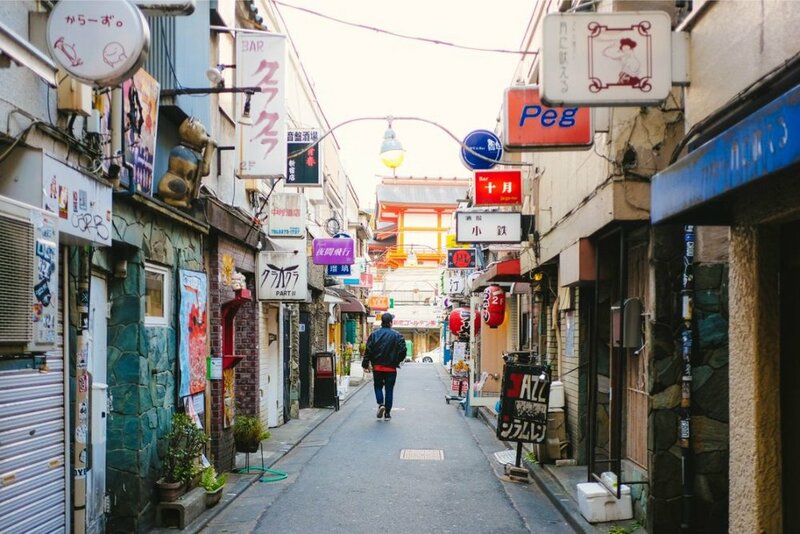 We had an amazing time exploring Namba and meeting fellow travelers eating their way through Japan as well. After the tour we decided to explore Dotonbori, then it was back to the hotel because of our food comas. Thank you Ninja Food Tours!